My advanced tutorial series on How to Design and Mockup Your Enamel Pins in 3D is now on Skillshare! In this tutorial series I teach you how to mockup your enamel pin designs in 3D using 3 pieces of software: Adobe Illustrator, Blender (FREE), and Adobe's NEW Dimension software. While you automatically get access to this tutorial series with the purchase of the Enamel Pin Foundry (My awesome top-selling toolkit for quickly mocking up enamel pins in Photoshop), the tutorial series, alone, is now available as a Skillshare class. You have the option of getting BOTH the toolkit + the class series OR taking only the Skillshare class. What will you learn in this Skillshare class? 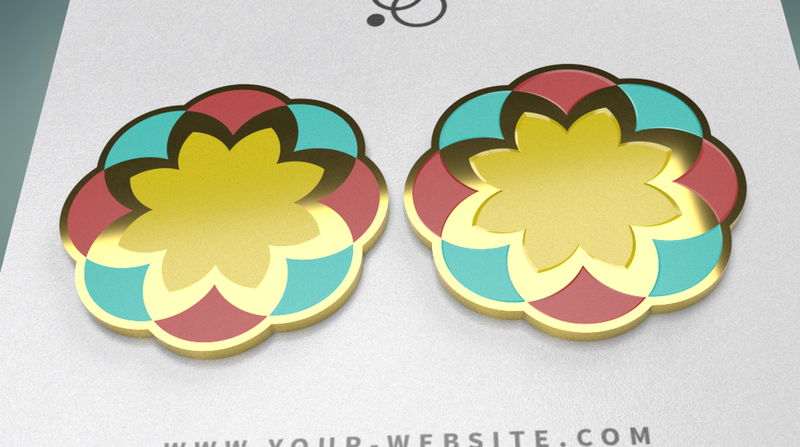 In this tutorial series I will teach you how to mockup your enamel pin designs in 3D using 3 pieces of software: Adobe Illustrator, Blender (FREE), and Adobe's NEW Dimension software. Bridging the gap from vector design to a 3D model in Dimension will allow you to render your designs at ANY angle, have complete control over the lighting in your scene, control the backdrop imagery, add additional objects to your scene, have complete control over your object's textures/materials, and more! It is recommended you have an intermediate to expert knowledge of Adobe CC software. You DO NOT need an intermediate or expert knowledge of Blender software. We will be using a few features from Blender that I will take you through, step-by-step. Recommended basic familiarity with Adobe Dimensions interface. Don't have a Skillshare account? Use my special teacher link below and you'll get 2 months of Skillshare FREE!